Summary: Even with its flaws, Ray is still a hugely enjoyable film. Before I saw Taylor Hackford’s biopic of the great man, my paltry experience of Ray Charles was limited to his jolly rendition of ‘Shake Your Tail Feather’ in the all-together brilliant The Blues Brothers. To be honest, I thought that, as a rather enthusiastic Stevie Wonder fan, I had as many blind, African-American, child-prodigy musical geniuses as I needed, thank you very much. As such, poor Ray has only ever been flickering in the background of my consciousness, and has never really had the chance to take centre-stage. Thanks to Hackford’s film, this injustice has now very much been remedied. And in this sense, Ray is an overriding success. For I am now not only particularly interested in Ray Charles the man, I am perhaps more importantly very interested in Ray Charles the musician. This is mainly in part due to the fact that Ray has some of the best musical numbers of any film I can remember. Of course, Hackford has been helped greatly by the fact that the music of Ray Charles is superb (after all, this is the man who is largely credited for creating soul music) and lends itself brilliantly to film. But this is a ball Hackford could easily have dropped. Fortunately he handles all musical numbers with consummate skill and simply allows the music to speak for itself. Which it does in volumes. There is no doubt, however, that Hackford has also been greatly helped by the fact that his leading man is able to invest the film’s scenes of a musical nature with a capability that is rarely seen in the cinema. I don’t know about you, but one of my major pet hates in a film is when an actor whose character is supposedly able to play an instrument has clearly never touched that instrument before in his life (Sean Penn helplessly plucking away at his guitar in Sweet and Lowdown immediately springs to mind). But this is not a problem in Ray, for in real life, Jamie Foxx is a superb pianist. 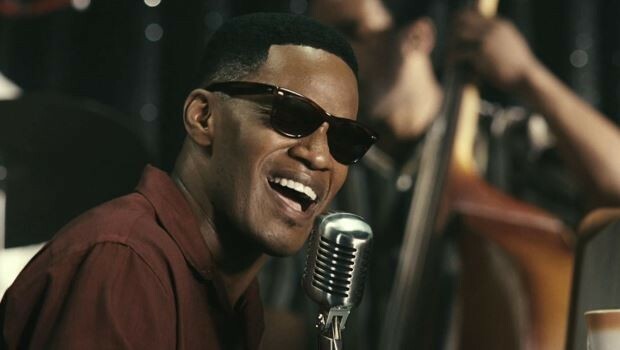 In fact, he was only given the role after Ray Charles himself saw at first hand his musical capabilities. Of course, Foxx’s ability to play a little piano is not his only strength. As you may well have heard, people have been going gaga over his performance in Ray, and as far as some people are concerned, he’s already won his Oscar. Well, in this instance, all the hype and heaping of praise is, for once, more than worthy. Because Foxx is just superb. Not only does he look and sound like Ray to an uncanny extent, he also manages to avoid simply giving a perfect yet soulless impersonation. He invests his role with a considerable amount of emotional depth and as such you get swept along with his character’s changing fortunes. It is a tour-de-force performance and deserves to be recognised as such. So, Ray boasts some great toe-tapping music and a fantastic central performance. But this is not to say that Hackford’s production is flawless. Covering Ray’s life from when he was a young boy who witnessed the tragic death of his younger brother, through to his teenage years as a traveller on the Seattle jazz circuit (where he discovered a penchant for heroin and women in equal measure), to his discovery by Atlantic Records and finally to his arriving at a life of fame and fortune still beset by the vices he picked up as a young man, Ray suffers from trying to cover too much in too short a period of time. In his attempt to leave no stone unturned, Hackford carries on with narrative lanes that arrive, often abruptly, at a dead end, thereby disrupting the film’s natural flow. Additionally, Hackford can’t seem to make up his mind if he can fully criticise a man whom he clearly idolises. So even though he shows Ray as a heroin addict, philanderer and at times, generally bad egg, he can’t quite bring himself to condemn the man for his actions. Which leads to the slightly unfortunate situation where some pretty inexcusable behaviour on Ray’s part appears to get excused. However, even with its flaws, Ray is still a hugely enjoyable film. And one things for certain – once you’ve watched it, you’ll never be able to go into a record shop again without having a quick peak at what they have in stock under the name Charles, Ray.